The Sea of Azov is a tiny and small sea that historically has not often earned much strategic attention from the countries that possessed it. However, history reveals that the strategic importance of the sea periodically rises when at least two countries possess the shores of this sea. The sea lends itself to regional geopolitical rivalry, and as a result of tensions both sides often create Azov flotillas. Such a contest existed during the Civil War in Russia and the Second World War when both the Soviet Union and Nazi Germany had to establish special naval units in the Sea of Azov. In general, Russia’s historical expansion to the South had three main directions – the Northern Caucasus, the Sea of Azov, and Crimea. All of these three geographical directions are fully interrelated. First, the Russian Azov Flotilla appeared in 1768 in order to fight the Crimean Tatars and Ottoman Empire. Now the geopolitical situation again necessitates that both Kiev and Moscow urgently create Azovian geographical units drawn from their naval forces. 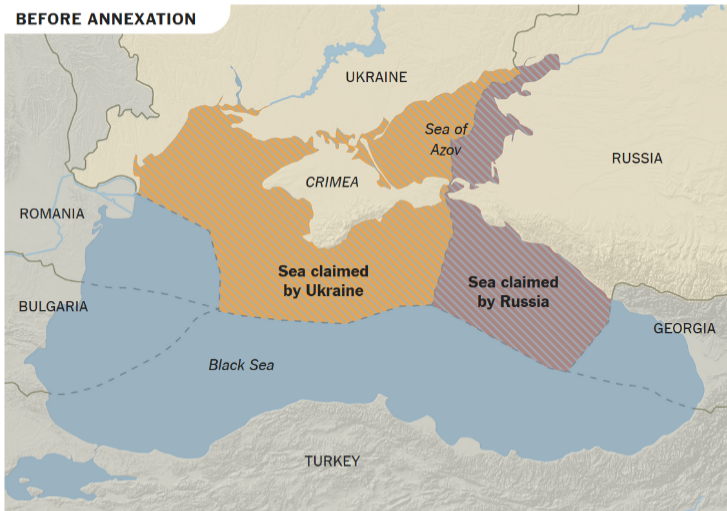 Since the annexation of Crimea in 2014, the Russian Federation became a full-fledged hegemon in the Azov Sea because of how the annexation of Crimea greatly expanded Russian coastal possessions. The Kerch Straits made Russia the keeper of a strategic chokepoint where the Kerch Strait acts as a gate to free waters and to Ukrainian and Russian Azovian ports. Interestingly, Russian river waterways facilitate a connection between the Black Sea with Russian cities that are almost located in Siberia and even deliver goods directly to Moscow or to the Baltics. In these regards, the possession of the Kerch Strait and access to the Sea of Azov has strategic meaning to Russia. As tensions have been building in recent months in the Sea of Azov Russia and Ukraine find themselves poised for further escalation. It is crucial to view Russia’s general vision regarding naval strategy and its place in the Sea of Azov since 1991 in order to understand the current state in broader context. Before Vladimir Putin, Russia’s leadership did not pay much attention to the country’s naval forces. But in 2000, the same year Putin came to power, the situation changed. Russia introduced the “Naval Strategy of Russia” in which there was pointed attention from the Kremlin in the Sea of Azov and the Black Sea. Putin personally participated in the drafting of the document. In the document it was clear that these seas, together with the Baltic and Caspian Seas, have serious importance to Russian national interests. With respect to the Sea of Azov Russia had proposed it be labeled as internal waters as the most suitable approach to national interests. Moreover, along with Moscow’s return to the old Soviet Union approach in trying to turn southern seas into “internal seas,” Russia wanted to establish a favored regime that would block every non-Azovian state warship from the entrance into the seas. Next year in 2001, Russia introduced the “The Russian Maritime Doctrine” where again the Kremlin asserted that the Sea of Azov is a part of national interests. According to the document, the longstanding interests of Russia in the Black and Azov Seas were the restoration of the naval and merchant fleets along with the inland navigation system (Don-Volga canal system), ports, and other infrastructure. It emphasized the necessity of addressing with the Ukrainian government the legal status of the Black Sea Fleet and to ensure that Sevastopol remains the main base of the Fleet. And finally, it discussed the creation of conditions for basing and using the components of maritime potential that would protect the sovereignty as well as international rights of the Russian Federation in the Black and Azov Seas. Next, the “Naval Strategy of Russia 2020” was issued in 2012 and neither of the seas were mentioned. However, it was clear that some aspects of the document were related to the Sea of Azov and that Russia was facing restrictions to full access to the global maritime domain, and faced disputed maritime claims from neighboring countries. After the alteration of the international environment and due to the annexation of Crimea, Moscow released the “Maritime Doctrine 2020” in 2015, and again paid full attention to the region and categorizes the Black and Azov Sea as a part of the “Atlantic Regional Priority Area.” It highlights the region as crucial for national interests partly because it is proximate to NATO. On July 20, 2017 Putin signed “The fundamentals of the state policy of the Russian Federation in the field of naval policy for the period up to 2030.” Again, previously mentioned threats were indicated, but the language of the document changed gravely in that it became more antagonistic and aggressive. The Azov Sea was mentioned regarding the necessity of maintaining favorable legal regimes around the state border of the Russian Federation, the border area, in the exclusive economic zone, on the continental shelf, as well as in the waters of the Caspian and Azov Seas. Without the Crimean peninsula it is impossible to fully appreciate the security implications for Russia’s policy in the Azov Sea. In Crimea, according to the document, it was recommended that Russia pursue an increase of the operational and combat capabilities of the Black Sea Fleet by developing an interspecific grouping of forces on the territory of the Crimean peninsula. A historic moment that sheds light on Russia’s strategic vision in the Sea of Azov is the Yeysk meeting in 2003. The Tuzla Island conflict started on September 29, 2003 when Russia initiated the construction of an artificial dam on the tiny island within the Kerch Strait, and the Yeysk meeting was conducted under Vladimir Putin’s supervision on September 17, 2003. On the same day before Yeysk, he had met with Ukrainian President Leonid Kuchma where he clearly stressed that “the Sea of Azov must be the internal sea of Russia and Ukraine.” Already in Yeysk (an important Russian city on the Azov shores with heavy military presence), Putin held a historical meeting for Russian geopolitical ambitions in its southern region. All the most important ministers responsible for the state military, naval, and security policy were present. Negotiations regarding the status of the Sea of Azov and the Kerch Strait began in 1995, and Russia steadily avoided finalizing them on Ukrainian terms. Only after the Tuzla Island crisis in September 2003 did Ukraine and Russia finally sign the agreement in December of the same year. At the same time, the biggest political disaster that Russia faced as a result of Tuzla crisis was the consolidation and hardening of the Ukrainian nation toward Russia. The Tuzla events were partly preconditions for the Orange Revolution in 2004. For the first time in many years it posed the possibility of a direct confrontation between the two nations. After the Orange Revolution in 2004 new political leadership in Kiev called for a revision of this agreement and considered it a deal that had been imposed on Ukraine by the use of political and diplomatic pressure. Since then, negotiations were conducted many times but Ukranian President Viktor Yushchenko could not manage to settle the issue on Ukrainian terms. It should be taken into account that even the 2003 agreement did not satisfy Moscow, but it was definitely a victory for Moscow after years of contention. Ukraine was holding the largest and richest share of fish zones in the Sea of Azov and had total control of the Kerch-Enikale Canal. But for Russia, it secured the Sea of Azov from any possibility of foreign warships entering the sea, and Russia earned the ability to use the Kerch-Enikale Canal freely. Before, Russian vessels had to pay Ukraine for passage in and out of the Kerch Strait. Finally, the signed treaty that ended the dispute had a positive impact on Russia because Ukraine was forced to recognize the Sea of Azov as an internal sea. Thus the sea was sealed from third-party countries. Unfortunately, Ukraine in 2003 did not effectively use international law and the influence of the West in order to settle the issue with Russia. NATO behaved in a very tempered manner and avoided taking sides. Ukrainian President Kuchma publicly asked the General Secretary of the NATO Lord George Robertson for an intervention into the confrontation before his departing to Moscow. Moreover, the head of the foreign office of the EU presented almost the same position of NATO and EU when he said the conflict “will be resolved and defused among themselves.” In 2010 when the regime of Yanukovich came to power, Russia made the status of Sevastopol a priority (the Kharkov Agreement), but negotiations about the Kerch Strait and the Sea of Azov never stopped because Russia wanted further expansion. Particularly in terms of favorable regimes, in the Kerch Strait they proposed the creation of a joint venture that would operate in the Strait. In 2013, Putin officially returned to the Sea of Azov question but he never returned to this topic very publicly. Even since the annexation of Crimea, he delegated the issue while he was silent about it himself. After the Maidan Revolution, the new Ukrainian political elite confronted the agreement but did not manage to revise it. According to the 2003 agreement, Ukraine has legal control over 62 percent of Sea of Azov’s area and Russia only 38 percent, but since the annexation of Crimea, Russia possesses de facto three-quarters of the territory of the sea. It tries to impose this fact in relations with Ukraine. Plus, Russian proxies are possessing additional territories in the East of Ukraine that plays on Russian advances. The whole coastline of the breakaway Donetsk People’s Republic is approximately 45 km. In their territories, there are plans to erect a naval base in the Obryw village. It is more likely that Russia will be denying its involvement in the creation of the base. Therefore, in the Sea of Azov there are three major established naval centers in the zones of control under Ukraine, Russia, and the separatist republic of DPR. 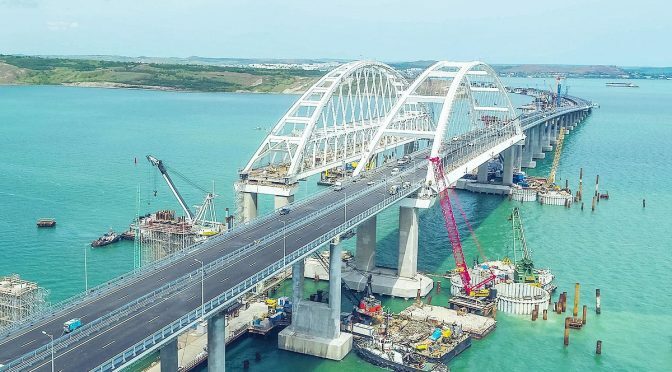 Additionally, a great hindrance to the free navigation of international and Ukrainian ships was incurred with the opening of the Kerch Bridge in May. The bridge has an air draught of 33 meters and a water draught of eight meters which restricts the entrance of larger ships into the Sea of Azov. Notwithstanding the fact that Ukraine is reportedly eager to denounce the 2003 Agreement, Russia could go even further unilaterally – eventually sealing the free passage in the Kerch Strait to the Ukrainian merchant fleet. In this scenario Ukraine could have to pay for passage as Russia did before 2003. The Ukrainian economic losses to date are obvious. For instance, only from January to July Ukraine lost 50 percent of fishing, 30 percent of the profit of ports, and most importantly, the share of the ports in metallurgical export deteriorated to 50 percent. This trend will only be broadening and it is even possible to say that in the long-term Russia may attempt to eventually halt commercial activities. This could lead to social and political protests against the current political elite in Kiev if the situation does not change. Furthermore, Russia has plans to extract and use Ukrainian and Crimean Tatar natural resources from Crimea and the Sea of Azov such as the Azov-Berezansky and Indolo-Kubnasky oil and gas fields. Estimated oil and gas deposits in the Sea of Azov are 413 million tons. As a result of the Ukrainian water blockade of Crimea, Moscow may also be desperately seeking the fresh water in the Sea of Azov. Russia caught Kiev in three main geopolitical traps. First, if Ukraine is going to confront Russia and demonstrate principality in the Azov sea, she should take into account that economic and social deterioration will become a direct consequence of this confrontation. Even though Ukraine goes to a stiff political stance in confronting Russia, international maritime companies will be avoiding this region and will try to find alternative routes. It should be noted that a quite popular idea with Russia is that of mining the Ukrainian coastline. Definitely these kinds of measures do not attract foreign investments. Second, Ukrainian naval forces are incomparable with Russian forces. Moscow is the absolute naval hegemon in this sea. Third, it is a “denunciation” trap. In Ukraine, denunciation is quite popular but some voices are against the argument that Ukraine will be deprived of a free passage through the Kerch Strait for the Ukrainian merchant fleet. The Ukrainian answer is offered by several measures. First, is a “law binding” policy. In 2016 Ukraine filed a lawsuit against the Russian Federation to the Permanent Court of Arbitrations – “Dispute Concerning Coastal State Rights in the Black Sea, Sea of Azov and Kerch Strait (Ukraine vs. the Russian Federation).” Interestingly, Russia is actively engaging in the process. 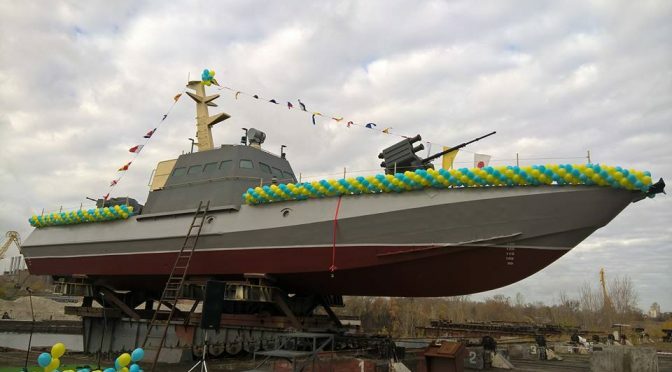 Second, it is the establishment of sufficient naval forces (an “Azov flotilla”) by using external and internal sources for naval enforcement – for instance, building additional gunboats “Gurza-M” (Project 58155). For instance, Capitan Andriy Ryzenko presented a strategy of a “Mosquitoes Fleet” as the best option to counter Russia expansion in the sea. Currently, NATO and Ukrainian specialists are engaged in preparation of the “Naval Strategy 2035” that will take into consideration the recent developments in the Sea of Azov. Ukraine is considering the possibility of convoying Ukrainian and European vessels into the Sea of Azov. Additionally some Ukrainian politicians are voicing the necessity of sanctioning Russian ports in the Black and Azov seas for Russia’s unlawful activities and to develop the coastal missile defense systems that could deter Russia from direct invasion of Mariupol and Berdyansk. Western reaction to the developments in the Sea of Azov have not been prompt since the recent confrontation began in March 2018. On August 30, the U.S State Department issued a press statement “Russia’s Harassment of the International Shipping Transiting the Kerch Strait and Sea of Azov.” The State Department called on Russia to cease its harassment of international shipping. On October 24, the General Secretary of NATO Jens Stoltenberg stressed during a press conference NATO’s concern regarding the situation in the Sea of Azov and about importance of the freedom of navigation both for Ukrainian and NATO ships in this sea. Interestingly, on October 31 there was a regular official meeting of the NATO-Russia Council in Brussels where according to the press release both sides discussed the situation in Ukraine and the escalation in the Sea of Azov but without any public details. In Brussels, already in the middle of summer there were some discussions regarding the situation in the Sea of Azov. For example, on October 9, the European Policy Center conducted the event “Occupied Crimea: The impact on human rights and security in the Black and Azov Seas” that has been dedicated particularly to the recent escalation in the region. Representatives of the European Parliament, Ukrainian Ministers, experts and former NATO officials took part in the event. In the European Parliament of Subcommittee on the Security and Defense (SEDE) a very effective hearing was held with a fruitful discussion and provided analytical grounds for the European Parliament’s Resolution. Additionally, the Chair of the SEDE, Anna Fotyga, together with the other MPs, visited the east of Ukraine on 16-20 September where they observed the security situation in the contact-line in Donbas and in the city of Mariupol. In the SEDE hearings on October 11, “On the Security Situation in the Azov Sea” in the EP there were officials from the European External Action Service responsible for the Eastern dimension of the EU foreign policy, including Ambassador Konstiantyn Yelisieiev who is now the Deputy Head of Presidential Administration to the President of Ukraine and NATO’s officials. At the same time Yelisieiev outlined the necessity of the technical and economic assistance to Mariupol and Berdyansk. Moreover, on behalf of Ukrainian government, he was asking for the extension of sanctions against southern ports of Russia. As he noted “lack of the common response instigates the aggressor’s appetite.” He reiterated that the best option to deter Russia is to be braver in Ukraine and to finalize the membership action plan. NATO representative Radoslava Stefanova, Head of the Russia and Ukraine Section, Political Affairs and Security Policy Division, stated that the case of the Sea of Azov is a much broader problem that is happening in the southern flank of the NATO. Three littoral states have access to the Black Sea together with strategic partners (Ukraine and Georgia) and since the Warsaw Summit NATO is trying to establish stronger presence in this region. During the last year and a half, NATO is actively involved in the assistance of the reconstruction of Ukrainian naval and maritime capability and the associated training. NATO, according to Ms. Stefanova, has reinforced the staff in Kiev and especially to those fields that are related to security and defense, and even sent to Kiev more experts to prepare a Ukrainian naval strategy. Another event of interest is the Plenary Session in Strasbourg on October 23 “On the Situation in the Sea of Azov” together with the Vice-President of the Commission Federica Mogherini. In her speech, she outlined that the EU is concerned about the situation in the sea and its militarization and reiterated the EU’s support to Ukraine. She emphasized that militarization of the sea is threatening to undermine the wider Black Sea region and this is in no one’s interests. What is also of note is that she said that the Black Sea is a European sea – an idea that is not welcomed in Russia and is considered aggressive. In general, the discussion during the plenary session demonstrated full commitment and almost absolute majority to support Ukrainian sovereignty and asked for further development of sanctions against the Russian Federation. Underlines the necessity to send mission experts to Mariupol that will be assessing the damage to the region and look at alternative ways of maintaining regional, social, and economic sustainability. Regarding the recent escalation in the Black Sea zone of the Kerch Strait the western reaction was again quite restrained. The U.S State Department issued a statement indicating that they are concerned with the dangerous escalation in the Kerch Strait and that it “condemns this aggressive Russian action.” Washington again called for both parties to “exercise restraint and abide by their international obligations and commitments. We urge Presidents Poroshenko and Putin to engage directly to resolve this situation.” It is possible to assume that such a vague statement holds little water with Ukraine. Something similar happened with the European Union’s reaction where it defined the situation as dangerous and called on both sides to exercise “utmost restraint” and called for de-escalation. The Turkish Republic also called for the peaceful resolution of the confrontation, and the Turkish Foreign Affairs Ministry stated that it is concerned that Ukrainian vessels were fired upon but it does not make any reference to Russia. Even so, Ukraine together with its allies, managed to conduct an emergency meeting at the UN Security Council but it did not had desired effect. The most lackluster reaction was the aftermath of the private meeting of the Political and Security Committee in Brussels that refrained to go tougher against the Russian Federation. Thus we could see that the consequences of the incident remain unclear. The international reaction demonstrates to Kiev that it is not ready to escalate the situation. At the same time, it is more likely that both the European Union and the United States are going to provide more measures to deter Russian hegemony in the Sea of Azov and Black Sea. 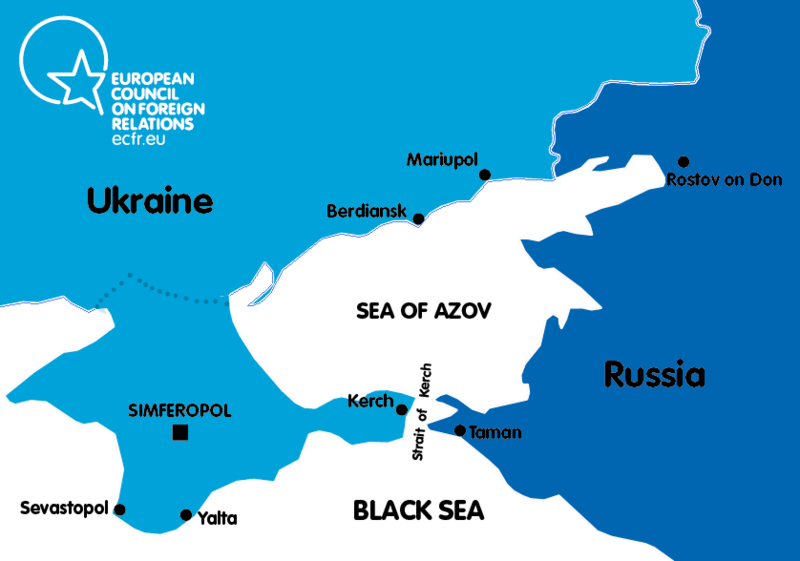 Almost five years after the annexation of the Crimean peninsula it appears that Russia is again trying to impose a long-term strategy to deal a crucial blow in Ukraine via the Sea of Azov. In Moscow they count on strategic patience, and as Putin said “in long-run strategy we must win.” Western answers and reactions have to be strong and preventative. The case of the adopted EU resolution is direct evidence of how interested Western commitments are. But if the recommendations in the resolution remain on paper it means that aggressive Russian behavior is poised to deal another blow to Ukraine and the West. Ridvan Bari Urcosta is a research fellow at the Center of Strategic Studies, University of Warsaw. The following two-part series will analyze the maritime dimension of competition between Ukraine and Russia in the Sea of Azov. Part 1 analyzes strategic interests, developments, and geography in the Sea of Azov along with probable Russian avenues of aggression. Part 2 will devise potential asymmetric naval capabilities and strategies for the Ukrainian Navy to employ. Ukraine’s bid to join NATO, under the Partnership for Peace, and closer association with the European Union, have stirred Russian sensitivity and suspicion of Ukrainian and Western intentions.2 In 2014, Ukrainian President Yanukovych declined to sign an Association Agreement with the European Union to expand bilateral trade. Instead, he signed a trade agreement with Russia. Consequently, Ukrainians took to the streets of Kyiv in the Euromaidan protests, which led to the ouster of President Yanukovych. The new President, Poroshenko, refused to sign the 25-year extension on the lease of Sevastopol naval base in Crimea to the Russian Navy. Russia responded immediately by taking over Sevastopol and Crimea through Russian proxies clad in unmarked fatigues. To date, Russia has not returned Crimea and its naval base in Sevastopol. Ukraine must be able to defend its borders and sovereignty so that it can contribute to the stability of the Black Sea region. Current constrained budgets necessitate that Ukraine pursue a pragmatic maritime strategy grounded in the following geopolitical realities: it will not be a NATO ally, it will not have a great sophisticated navy, and it can no longer rely on Russia’s defense. If Ukraine continues on the current path, Ukrainian Navy’s weakness, Russia’s need to resupply Crimea, and Kerch Strait Bridge construction delays will tempt Russia to gain control of the Sea of Azov (SOA) to establish a land corridor between Russia and Crimea through the Donbas and Priazovye Regions. Therefore, a new Ukrainian maritime strategy must defend the SOA and deter Russian encroachment by building an asymmetric force, conducting joint sea denial operations, and establishing a naval base in Mariupol and forward-deploying a part of its fleet to the SOA. Since the Soviet Union’s dissolution, Russia and Ukraine have failed to agree on the demarcation of maritime borders in the SOA and Kerch Straits.3 In Ukraine’s National Security Strategy published in March 2015, President Poroshenko defined current security challenges that exist below the threat level, but could elevate into a more robust military threat. Specifically, it cited the unfinished border demarcation in the Black Sea and SOA as a potential flashpoint.4 Ukraine has responsibilities to protect its Exclusive Economic Zone (EEZ) in the SOA and Black Sea under the 1982 United Nations Convention on the Law of the Sea Treaty (UNCLOS).5 Ukraine has insisted on designating the SOA as an open sea under UNCLOS, as it links directly to the Black Sea and the world’s oceans.6 The Russian Government has, however, rejected Ukrainian claims. As an alternative, Russia called on Kyiv to abide by a 2003 agreement signed by the previous Ukrainian Government, which designated SOA as internal waters of Russia and Ukraine to be jointly owned, managed, and unregulated by international law.7 More recently, Ukraine has instituted arbitration proceedings against Russia under UNCLOS to adhere to maritime zones adjacent to Crimea in the Black Sea, SOA, and Kerch Strait.8 As a result, Ukraine asserts that Russia has usurped Ukrainian maritime rights in these zones. However, these legal actions have not halted Russian maritime aggression. In mid-September 2016, Russian vessels illegally seized Ukrainian oil rigs in the region and chased Ukrainian vessels out of the area.9 Tensions continue to mount as Russia solidifies its gains in Crimea, extending to offshore claims against Ukraine. Russia and Ukraine’s relationship has shown no sign of improvement as more resources are discovered on its seabed. Exxon Mobil, Royal Dutch Shell and other major oil companies have explored the Black Sea, and some petroleum analysts say its potential may rival the North Sea.10 In addition, natural gas exploration has availed as many as 13 gas and dry gas deposits with a combined 75 billion cubic meters (bcm) of prospected resources discovered on the shelf, seven in the Black Sea and six in the SOA.11 Subsequently, three new gas deposits have been found on the southern Azov Sea shelf. Since taking over Crimea, Russia has made new maritime claims around Crimea in the SOA and Black Sea (see Figures 2 & 3 showing Russian maritime claims before and after Crimea’s annexation). President Vladimir Putin declared the “Azov-Black Sea basin is in Russia’s zone of strategic interests,” because it provides Russia with direct access to the most important global transport routes.12 In addition to commercial routes, keeping hydrocarbon resources from Ukraine is clearly among Russia’s interests. In addition to having access to the sea, Russia could also seek a land corridor connecting Crimea to Russia through the Donbas Region.15 There are at least two primary reasons for Russian leadership’s desire to encroach further on Ukraine’s territory. First, Russia needs to protect new claims in the Crimea, SOA, Black Sea, and its maritime resources. Second, Russia needs to increase the capacity to resupply Crimea through a land corridor connecting Crimea to Russia. Since the occupation of Crimea, Ukraine closed the northern borders of Crimea and Ukraine. This forces Russia to supply Crimea with food and basic wares from the sea, mainly via ferries across the Kerch Strait from Krasnodar Region to Crimea. The reliance on a single ferry system could cause a bottleneck in traffic when it reaches a daily limit on supplies carried across the Strait. Crimea depends heavily on Russia to fulfill basic services, with 75 percent of its budget last year coming from Moscow, in addition to supplying Crimea with daily electricity rationing.16 A land line of communication (LOC) via a road between Crimea and Russia would alleviate the burden of supplying Crimea by sea only. The highway along the Azov coast is the shortest link. Realizing the SLOCs are limited, Russia is building the Kerch Strait Bridge, which will connect the Crimean Peninsula to Russia. Until its completion in 2019, however, there is no land LOC to sustain the economy and bases in Crimea. Therefore, SOA carries significance for its sea line of communication (SLOC) from Russia to Crimea. Protection of this SLOC is Russia’s main objective to consolidate its gains and secure sustainment of Crimean bases. Only then would Russia be able to use Crimea as a lily pad for power projection into the Black Sea. The Kerch Strait Bridge construction, however, is beset with delays. Due to sanctions placed on Russia by the E.U. and the U.S., Russia is in dire financial straits which puts the completion of the bridge at risk. The construction cost of the bridge is expected to cost more than $5 billion as construction delays mount.17 Unpaid workers are quitting the project in protest over dangerous working conditions.18 With uncertainty over the bridge’s construction and overcapacity of the ferry, the need for land routes to Crimea becomes even greater. Because Ukraine closed its borders to Crimea in protest against Russian occupation, Russia must forcibly establish a LOC. In order to establish a LOC corridor, Russia must control the SOA. Defections, low morale and training also plague the Ukraine Navy, decimating its end strength. 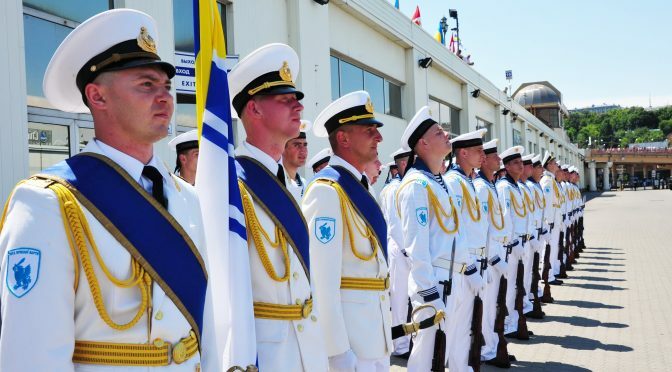 Many sailors defected to Russia during the Crimea crisis.22 There is a systemic failure to invest in training and personnel, with housing shortages and low personnel pay depressing morale and retention.23 Old ammunition stockpiles adds to training issues. Ukraine will not win a symmetrical engagement on the open water against the Russian navy. As a result, Ukraine must seek comparative advantages in the asymmetric realm by addressing tangible and intangible issues in force structure, doctrine, morale, and training. If Russia were to strike at the Ukrainian Achilles’ heel, it would attack from the sea taking advantage of Russia’s dominance in the SOA and Kerch Strait vice attacking on land. This is due to the Ukrainian Army being a more sizeable and proficient force compared to the Navy that is weak and underfunded.24 Russia’s control of Crimea shortens its line of operations (LOO) into eastern Ukraine. With uncontested control of SOA, Russian transports will have the freedom of maneuver to assemble forces in the SOA and utilize interior lines of attack along the [Ukrainian] coast.25 Russia will be able to maximize three enabling functions to increase combat power: sustainment using shorter SLOCs, protection of its transports and flanks by gaining sea control to then conduct amphibious landings, and establishment of effective command and control (C2) of forward-deployed forces through shorter lines of operations and an advantage in factor space. Consequently, Russia will be able to increase combat power of its limited “hybrid” troops to seize objectives ashore. Therefore, a strong navy is necessary to deny Russian forces from using the sea to seize the Azov coast. Strategically, Russia will weigh the benefit of seizing more Ukrainian territory to establish a LOC between Crimea and Russia against the costs of likely Western sanctions or retaliations. Russia will seize the initiative upon any perceived Ukrainian or international weakness that presents an opportunity. Russian Op idea would be to reach objectives along the Azov coast with speed, surprise, and plausible deniability using amphibious crafts Ropucha and Alligator-class LSTs, LCM landing crafts, and LCUA/LCPA air cushion landing crafts or a combination with commercial ships/boats.26 Hybrid forces clad in civilian clothing will use speed, surprise, and plausible deniability to seize decisive points along the Azov coast maximizing the shortened LOO/LOC to seize the ultimate objective of Mariupol. Russia will seize on Ukraine’s critical weakness—sporadic or non-existent naval presence in the SOA. The Russian Navy will assert sea control in the SOA, and attempt to close Mariupol port through a blockade. Russia’s critical strengths and operational center of gravity (COG) are its well-trained and commanded special and ground forces, which are key to seizing territory and linking the Crimean Peninsula to Russia by land. Separatist forces from the Donbas Region will support by encircling Mariupol from the north. The Russian Navy and Air Force will likely support the ground offensives through naval gunfire, land-attack missiles, and air support to attack defensive positions along beaches and cities. Russia will ensure unity of command between the special forces, navy, and separatist forces by maximizing functions of intelligence, C2, sustainment, fires, and protection combined with principles of war such as speed, initiative, surprise, deniability, and concentration of force to enable success. Russia will complement the offensive using hybrid warfare techniques such as a strategic media blitz and cyber warfare to win the war of the narrative and global opinion. Various Russian media outlets such as RT will broadcast the Russian strategic narrative that it will protect Russian speakers in the near abroad and will reunite inherently Russian territory back to the motherland. Furthermore, Russia will use the cyber domain not only to carry out media warfare, but will use it to attack Ukrainian government websites and infrastructure through denial of service attacks and more sophisticated cyber-attack vectors. Thus, cyberspace will be a key domain of its main attack vector in addition to air, sea, and land. Part 2 will devise potential asymmetric naval capabilities and strategies for the Ukrainian Navy to employ. LCDR Jason Yuki Osuga is a graduate of Johns Hopkins University’s School of Advanced International Studies (SAIS) Europe Center and the U.S. Naval War College. This essay was originally written for the Joint Military Operations course at NWC. Julian S. Corbett, Principles of Maritime Strategy, (Mineola, NY: Dover Publications, 2004), 87. Janusz Bugajski, Cold Peace: Russia’s New Imperialism (Westport, CT: Praeger Publishers, 2004), 56. Deborah Sanders, “Ukraine’s Maritime Power in the Black Sea—A Terminal Decline?” Journal of Slavic Military Studies 25:17-34, Routledge, 2012, 26. Maksym Bugriy, “Ukraine’s New Concept Paper on Security and Defense Reform,” Eurasia Daily Monitor 13, No. 79. April 22, 2016. Deborah Sanders, “Ukraine’s Maritime Power in the Black Sea—A Terminal Decline?”, 18. Roman Olearchik, “Ukraine Hits Russia with Another Legal Claim.” Financial Times. September 14, 2016. Accessed October 6, 2016. http://www.ft.com/fastft/2016/09/14/ukraine-hits-russia-with-another-legal-claim/. William J. Broad, “In Taking Crimea, Putin Gains a Sea of Fuel Reserves.” The New York Times, May 17, 2014. 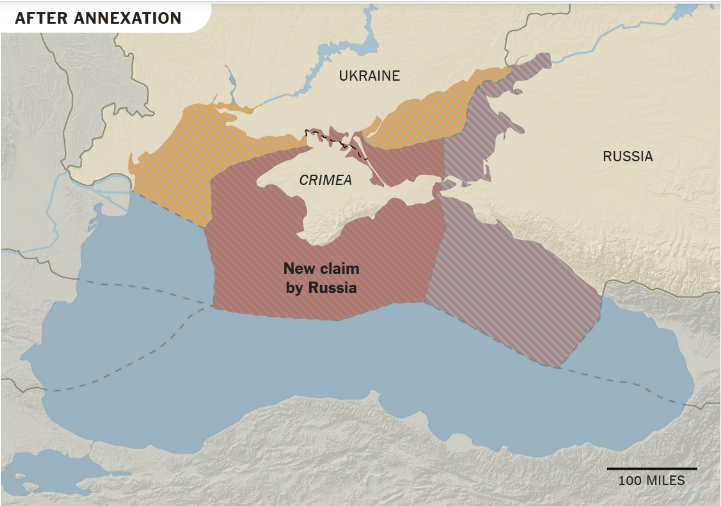 Accessed 10 Oct 2016, http://www.nytimes.com/2014/05/18/world/europe/in-taking-crimea-putin-gains-a-sea-of-fuel-reserves.html. “Ukraine to Tap Gas on Black, Azov Sea Shelf.” Oil and Gas Journal, November 27, 2000. Accessed October 7, 2016. http://www.ogj.com/articles/print/volume-98/issue-48/exploration-development/ukraine-to-tap-gas-on-black-azov-sea-shelf.html. Deborah Sanders, “U.S. Naval Diplomacy in the Black Sea,” Naval War College Review, Summer 2007, Vol. 60, No. 3. Newport, RI. William J. Broad, “In Taking Crimea, Putin Gains a Sea of Fuel Reserves.” The New York Times. Steven Pifer, “The Mariupol Line: Russia’s Land Bridge to Crimea.” Brookings Institution, March 15, 2015. Accessed 24 Sep 2016, https://www.brookings.edu/blog/order-from-chaos/2015/03/19/the-mariupol-line-russias-land-bridge-to-crimea/. Ander Osborn, “Putin’s Bridge’ Edges Closer to Annexed Crimea despite Delays.” Reuters, April 18, 2016. Accessed 24 Sep 2016, http://www.reuters.com/article/us-ukraine-crisis-crimea-bridge-idUSKCN0XF1YS. Daria Litvinova, “Why Kerch May Prove a Bridge Too Far for Russia.” The Moscow Times, June 17, 2016. Accessed 30 Sep 2016. https://themoscowtimes.com/articles/why-kerch-may-prove-a-bridge-too-far-for-russia-53309. Amy B. Coffman, James A. Crump, Robbi K. Dickson, and others, “Ukraine’s Military Role in the Black Sea Region,” Bush School of Government and Public Service, Texas A&M University, 2009, 7. Eleanor Keymer, Jane’s Fighting Ships, Issue 16 (Surrey, UK: Sentinel House), 2015, 642. Janusz Bugajski and Peter Doran, “Black Sea Rising: Russia’s Strategy in Southeast Europe.” Center for European Policy Analysis, Black Sea Strategic Report No.1, February 2016, 8. Sam LaGrone, “Ukrainian Navy is Slowly Rebuilding,” USNI, May 22, 2014. Deborah Sanders, “Ukraine’s Maritime Power in the Black Sea—A Terminal Decline?”, 25, 29. Milan Vego, Joint Operational Warfare: Theory and Practice, (Newport, RI: U.S. Naval War College, 2009), p. IV-52. Eric Wertheim, Guide to Combat Fleets of the World, 16th edition, (Annapolis, MD: Naval Institute Press) 2013, 608-610.